Hello after some friends on Facebook reporting that protracker is hard to use because of the glitches made when channels are playing in protracker i need to inform the team that also after core 2.7 the glitches are here and worse than core 2.5. 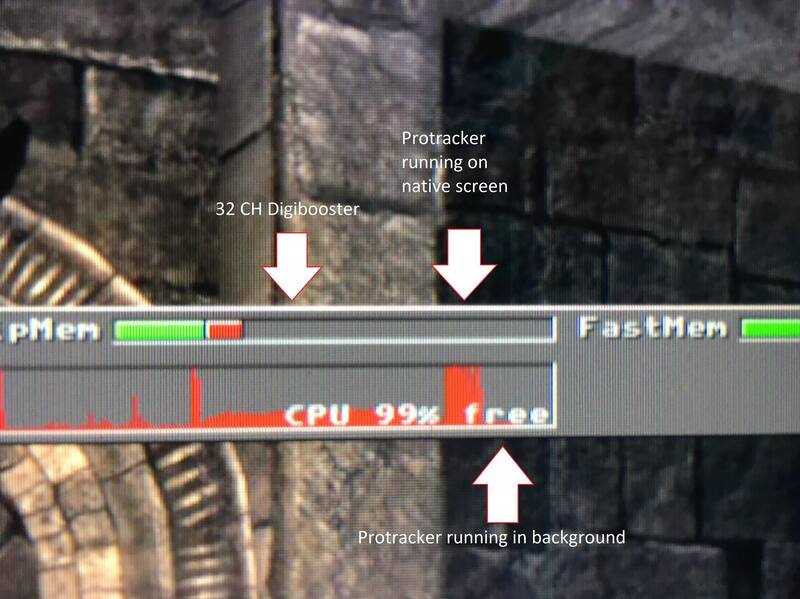 A friend reported that the CPU is is on 99% when protracker is playing a module. After using digibooster with a 32ch .XM 9mb module the cpu is on 50%-60% with AHI on 14bit stereo++ with no problems. Please can you make a fix for protracker apps ? This happens from protracker 1.8 to 3.15 and more. Yes exact the same problem here ! Thanks for the report, we are looking into this. Thanks Gunnar. I know that the team works hard for everything. Also the glitch happens on lcd monitors too. There's no problem with protracker. You need a 060 friendly version. but thank you for your research ! It's better for this issue to be fixed because I never used 2.3 protraker in my life. I was and I still use 3.15 - 3.62 versions a lot and many others doth same. Please make a fix if you can. It's a serious problem as I use my Vamped A600 to make music a lot. This is not normal that the CPU maxes out with protracker thats not normal and its a glitch that evolves all protracker apps. I cant understand why this happens but its a big problem (at least for me) I use protracker apps a lot. Some newer versions help me to make some effects on samples that you cant make on 2.3e like the mod2samp on latest versions. I tested also on 2.7 core and did the same. I changed to core 2.8 and the same glitches happen. Can you please share one of those problematic module to reproduce it ? The 2.3E 060 fix works perfect on vampire with no glitches at all. Can this code be imported on 3.62 or 3.61 from the 2.3E 060 fix ? The highest cpu compatibility for 3.61 and 3.62 was for 030 and 000 only no 040/060 fix for those versions. Thats what I'm asking. Maybe if someone can code the 3.62 or 3.61 with the same 060 fix for 2.3E it will eliminate the problem.